Just steps to the beautiful Ngunguru Estuary, at the end of a quiet cul-de-sac, this surprisingly spacious and comfortable, fully furnished 2 bedroom, self contained property is your home away from home. We have thought of everything so you don't have to! The interior is clean, open plan, modern and fresh, there's a full kitchen with dishwasher and gas stove and oven and is complete with everything you need. Towels and bed linen are provided as well as tea and coffee making facilities. The use of a small dinghy and kayaks with life-jackets are also available. There's an outside laundry with extra toilet and shower. Large lawn out front for outdoor games, tents, campervans, boats and jet ski’s, off street parking or just lounging around in the sun. NB: A walkway at the rear of the bach allows beach access to people staying at the property above. Ngunguru has a 4 Square mini-mart, cafe, hairdressers, beauty parlour and Takeaways. The Sports Complex has a 9 hole golf course, tennis, bowls, and a Bar and Bistro. Only 7 minutes to Tutukaka with more shops and restaurants. At the Tutukaka Marina, and Deep Sea Anglers Club you can arrange fishing trips and/or diving or snorkelling at the world famous Poor Knights Marine Reserve. There are several restaurants to dine at around the area. Beautiful Matapouri Bay and the surf beach, Sandy Bay, are just a short drive away. There are several stunning coastal walkways to explore in this beautiful part of the world. World renowned Whale Bay is also on the coast. The Ngunguru estuary at your door step provides safe swimming for children and fishing and shellfish gathering. There is a boat ramp nearby where you can launch your boat to explore the pristine Ngunguru Bay and Sandspit and Ocean Beach. There's so much to do on the stunning Tutukaka Coast you'll never want to go home! 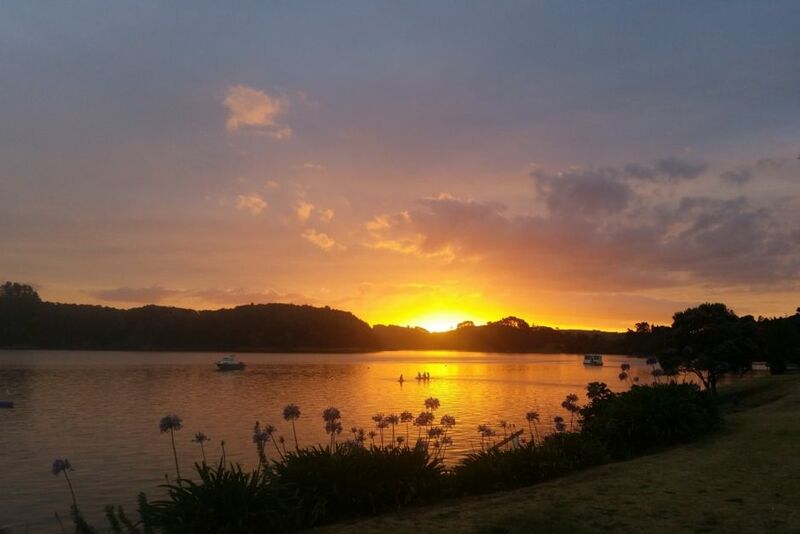 For the quintessential kiwi experience, in a beautiful location, you won’t be disappointed. Priced for up to 4 persons. Extra persons $15 pp per night. 2 Nights minimum stay in peak season and Christmas period minimum 1 week. This is negotiable depending on your circumstance - please ask! Linen and towels supplied, smoking outside only, pets ok as long as they are cleaned up after. The property at the rear above the bach has access to the beach via a walkway down the left side of the bach through the gate. Internet banking andamp; cash accepted, Paypal accepted but please add $1. Home away from Home, everything has been thought of! We are located right on the Ngunguru Estuary. Dinghy with oars, sorry no motor. On trailer. 100m walk to boat ramp for launching. Life jackets in shed. Steps leading from ground to deck. We loved this property. Unfortunately, I was sick with a cold so when I packed I forgot a heap of things such as cooking oil, pepper, honey, paper towels, etc. This house was equipped with everything I had forgotten Cushla was so pleasant, told us to help ourselves to anything in the pantry and garden. We used the BBQ and the stove/oven to cook our meals both days and didn't require anything extra. Unfortunately, we didn't get a chance to use the spa pool but it looked awesome. Beds were comfortable, house was clean and had lots of things to keep you busy (games, books, toys, etc). Would certainly stay here again. Highly recommend. You would be most welcome to return! Please ask about our generous return- guest discount! Such a lovely place. Probably the best stocked Bach we have ever stayed in. Amazing beaches close by, and comfortable beds. Superb guests! Left the place looking immaculate. Welcome back any time! Wonderful peaceful place to have a holiday, close to great beaches, walks and snorkelling. Very well maintained Bach with everything you could possibly want supplied. Cushla and Paul were very hospitable. Enjoyed the peaceful outlook to the estuary. Excellent guests - welcome back any time! This really is a home from home bach, as well as being both welcoming and comfortable. Cushla's generosity and kindness are exceptional and she had even left a full water bowl for my dog to enjoy a drink as soon as we arrived. The location is lovely, and is quiet and private. I look forward to returning in the not too distant future. Everything inside and outside this house is just perfect! it has everything you need and it's a couple of meters away from the water. Thanks Cushla for letting us stay in this lovely place :) will come back for sure! Many thanks! Awesome guests -;welcome back any time!